A Book Blog for Speculative Fiction, Graphic Novels… and more! I received a review copy from the publisher. This does not affect the contents of my review and all opinions are my own. After a slight dip, things in Rockton are back in full swing with this latest installment of the Casey Duncan mysteries. Summer has come to the Yukon and Casey is looking forward to taking advantage of the longer days, patrolling the woods around town with her boyfriend Sheriff Eric Dalton and training their boisterous Newfoundland puppy to help with police work. But then the peace is shattered when the powers that be inform Rockton that they will need to make accommodations for a new resident—which isn’t an unusual request by itself, but it soon becomes clear there’s nothing ordinary about this visitor. For one thing, Oliver Brady is a serial killer. While Rockton may house its fair share of criminals who are trying to keep a low profile, none of them are anywhere near so dangerous. Established as a haven for those hoping to escape their pasts, the town also lacks any facilities or resources to keep anyone in long term imprisonment. But that is exactly what Rockton’s handlers are demanding, expecting the town to keep Oliver locked up and out of the public eye for six whole months. And because he’s the stepson of a rich businessman who is paying handsomely to make this all happen, Eric and Casey have no choice but to do as they’re told. Still, no amount of warning could have prepared them for the trouble Oliver will bring to Rockton. From the moment he is dumped on their doorstep, bound and gagged, the young man has insisted on his innocence, claiming that he was set up. While Casey is almost certain it is all an act, Oliver does succeed in riling up the townsfolk who are disconcerted by his rough treatment, and before long, there is evidence to suggest he may have recruited a sympathizer or an accomplice. As a former homicide detective dedicated to seeking out the truth, Casey wants to believe in innocent until proven guilty, but neither can she deny that Rockton has become a much more dangerous place ever since the arrival of Oliver. 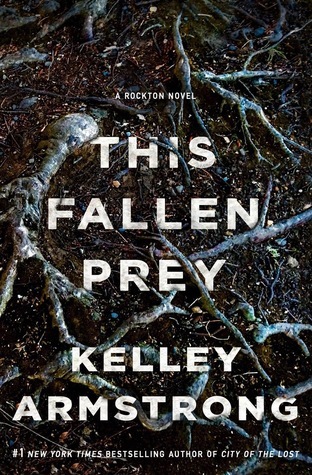 This series is three books in now, and just when I thought things might be slowing down, Kelley Armstrong is ratcheting up the action and suspense again in this unpredictable sequel filled with murder, subterfuge, and plenty of suspects. No doubt about it, this novel was a vast improvement over the previous one, which disappointed me after the strong start that was City of the Lost. First and foremost, the story of A Darkness Absolute was marred by its predictability; obviously, there was much less fun to be had when I was able to guess the perpetrator by the halfway point. The main characters were also forced into situations where they failed too many times, making me feel frustrated with their incompetence. In contrast, This Fallen Prey was a roller coaster of red herrings and unexpected twists. As a character and a plot device, Oliver has got to be every mystery reader’s dream come true, simply because there is absolutely no guessing his endgame. He’s a desperate man and a master manipulator, taking advantage of Casey and Dalton’s honorable intentions and desire to do the right thing. Oliver’s sudden arrival in Rockton turns their job into a nightmare, and between all the security issues and chaos of trying to keep everyone from poking around asking too many questions, it’s amazing they were able to keep the town from tearing itself apart. I also liked that we got to see more of the surrounding areas of Rockton, with the warmer weather giving our characters more time to spend outdoors rather than stay cooped up within the confines of the town. Isolated and in the middle of nowhere, you’d think there wouldn’t be that many suspects to consider, but the author pulls out all the stops in this one, reminding readers that there are plenty of unknown factors out there lurking in the woods, including hostiles, settlers, and even the local wildlife. For the first time in this series, we also end on a significant cliffhanger where not every loose end gets resolved. Although the big questions get answered, things are still far from over. Still, the highlight for me was being able to return to Rockton and catch up with the characters. Casey and Eric make a great team, and I’m liking how each book sees them growing closer. That said, the romantic drama has been downplayed with each sequel, which incidentally is what I prefer—after all, Casey Duncan is a mystery-thriller series, and Armstrong appears to have found the perfect balance between focusing on the suspense and action while continuing to develop character relationships without distract from the story. I can’t wait to read the next one. Audiobook Comments: Considering how much I love Therese Plummer, I just have to say a few words about her performance. She’s one of the finest narrators I’ve had the pleasure of listening to, reading the story with perfect timing and dramatization. A good narrator is the key to a good listen, especially when it comes to the thriller-suspense genre, and once again Plummer knocks it out of the park. I think this is my next read and I can’t WAIT. Glad to hear too that it’s a step up from Absolute, which I liked but, like you, not as much the first one. I can’t wait to see Casey back in action, and I’m itching to learn more about the settlers and the hostiles and whatever is out there. I hope you enjoy! I’m so eager to find out what you think! I agree …this is the best one! I just finished a few days ago. Great review. Oh I’m so glad to hear you enjoyed it too! It was so intense! I love Armstrong and really have no excuse for not reading this series. I guess I just never started it and therefore, found it hard to keep up. That’s sad considering I’ve read all of the Cainsville series as well as The Women of the Underworld series. Glad you enjoyed this one. Haha, sounds like you have enough Kelley Armstrong on your plate already at any rate! I’d love to try the Cainsville series one day! Glad to hear this worked out better than the last one. I’m sure it’s hard to keep up the momentum with a long running series. I don’t know if there is a planned number of books set, but a cliffhanger obviously means at least one more! This is one of the few mystery/thriller authors whose name I do know. I’ve always wanted to check out her Cainsville series though. Besides, I’m feeling a renewed interest toward thrillers, so I guess I will be adding this series to my reading queue soon, very soon. Thanks for sharing! This does sound like a good series to get on board with although at the moment I feel like I should complete a few of the series or at least play catch up with those I’ve already started. One for the future though. Welcome to The BiblioSanctum! A Book Blog for Speculative Fiction, Graphic Novels... and more! Steff (Mogsy), Tiara and Wendy are proud moms, geeks, gamers and bibliophiles. We're always reading and yet, there never seem to be enough books! Our Goodreads lists are an eclectic assortment of genres -- and we love to share our thoughts. The BiblioSanctum is a home for our absolute love of reading.